Laura Jane Addams was born on September 06, 1860 in Cedarville, Illinois, the youngest of four living children. She was the daughter of John Huy Addams, a wealthy grist mill owner and Illinois state senator (1854-1870), and Sarah Weber, who died in 1863. Her father married Anna Hostetter Haldeman in 1864, which brought two step-brothers into the family. Jane Addams graduated as valedictorian from Rockford Female Seminary (Illinois) in 1881, and was granted a Bachelor of Arts degree in June 1882. In 1883-1885, and again in 1887-1888, Addams toured Europe, seeing the sights and -- unlike most tourists -- viewing the poverty in the cities' slums and the efforts (such as Toynbee Hall) being made to alleviate it. In September 1889, Jane Addams and Ellen Gates Starr opened Hull-House to serve the immigrants in Chicago's nineteenth ward. By 1893, Hull-House had become a center for a wide variety of clubs, functions, classes and activities for the neighborhood. During the next forty years that Jane Addams resided there, Hull-House was to assume international significance as Addams and her associates championed the protection of immigrants, child labor laws and recreation facilities for children, industrial safety, juvenile courts, recognition of labor unions, woman suffrage, and world peace. 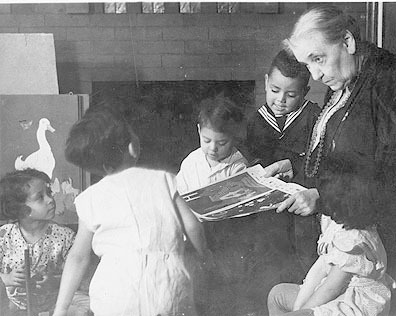 Addams never drew a salary from Hull-House, but instead used her inheritance and the proceeds from her many books and articles to live on as well as to underwrite these causes. With the publication of Newer Ideals of Peace in 1907, Jane Addams became known as a pacifist, a stand which brought her much ridicule and censure when the United States finally entered World War I. Yet by 1931, public opinion had swayed to embrace her ideas and that year she was awarded the Nobel Peace Prize, shared with Nicholas Murray Butler. By then, her reputation as the Mother of the World was firmly established. She received letters from people around the world not only praising her for her inspirational work, but asking her to intervene on their behalf as they struggled against hunger, poverty and oppression. Early in 1915, Addams was elected chairman of the recently formed Woman's Peace Party of the United States. Later that year she was selected as president of the International Congress of Women at The Hague. She was chairman of the International Committee of Women for Permanent Peace (1915-1919), a temporary organization which later became the Women's International League for Peace and Freedom (WILPF). Elected president of WILPF at its founding in 1919, Jane Addams presided over the League's many international meetings and in 1929 was made the organization's honorary president for life. She also served as a board member or on the advisory council of many peace organizations. The Jane Addams Collection that is part of the Swarthmore College Peace Collection consists of correspondence (1870-1935), Rockford Seminary notebooks, diaries, engagement calendars, writings and speeches by and about Addams, passports, visiting cards, reviews of her books, reference files, death notices, condolences, descriptions of memorial services, the Nobel Peace Prize medal, photographs, memorabilia/realia, and sound recordings. Also of note is a very large quantity of mounted clippings (1982-1935) about Addams and material related to the operation of Hull-House. Assorted papers (1838-1881) of her father, John Huy Addams, and of the Addams, Weber and Reiff families (1840-1881, 1908) are also part of the Jane Addams Collection. The personal library of Addams of books on the subjects of peace and international relations forms a separate special collection in the SCPC. All photographs are the property of the Swarthmore College Peace Collection. Permission must be gained from the Curator for any reproduction of the images.